Adrian Salguero. Photo by David Baillot. 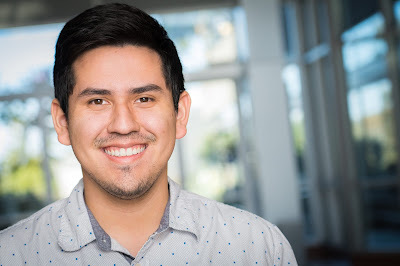 Adrian Salguero felt behind the curve when he started his computer science and engineering undergraduate degree at the University of California, Santa Cruz. He was relatively new to the subject while some of his classmates had been programming for years. But he stuck with it, and now he is earning his PhD in computer science and engineering at UC San Diego, one of the top ranked computer science programs in the country, as a Sloan Scholar. Sloan Scholars receive a four-year fellowship worth $40,000, meant to stimulate fundamental research by early-career scientists of outstanding promise. His focus within computer science is bioinformatics— using large amounts of data to better understand how different organisms are structured and function with the ultimate goal of better understanding human health. Bioinformatics is also a key component of genomics and cancer research. One project he’s working on now is using mass spectrometry data— which measures ions to identify the molecules within a certain mixture or material—from 51 different species of bacteria. He’ll use this data to create a spectral library for each species that will be analyzed to see what proteins, if any, exist in each species. This information will help researchers better understand what functions these proteins serve. Salguero grew up in South Gate, a city within Los Angeles County. While earning his bachelor’s degree in computer science at UC Santa Cruz, he participated in the Treehouse Cancer Initiative, which is where he first discovered the role that computer science plays in healthcare and cancer research. He also mentored other students through the Academic Excellence (ACE) program at UC Santa Cruz. As a first generation college student, he knew how valuable mentors can be. Salguero is brand new to campus, but plans to find similar mentorship opportunities while he works towards his PhD. He doesn’t have too much free time now, but when he does, chances are high that you can find him watching a movie—Star Wars is one of his favorites—or going for a jog on the beach. May the force be with you, Adrian.